Early stage lighting was once provided by a gas jet burning through a cylinder of lime, hence the term 'in the limelight'. Before electricity came along, "floats" were used to provide stage lighting in theatres. These were open trays of paraffin with a floating burner, arranged across the front of the stage. Not surprisingly, it was quite common for theatres to burn down. 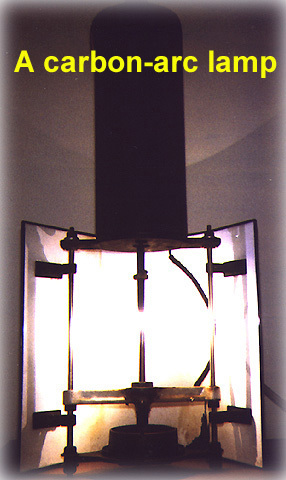 One or more "limelights" were used as spot lamps, with the moveable ones being known as followspots. These used a gas jet to heat a cylinder of lime, which glowed brightly in front of a polished metal reflector. Although quite brilliant, this early stage lighting sent out sparks and could be dangerous. Patti's dresses were known to catch on fire and stage hands had to be on hand at all times to put the flames out when this happened. With this in mind, Patti soon had a 110v d.c. system installed, with the power supplied by an early 'OTTO' gas engine. Craig y Nos castle was one of the first domestic residence in the UK, and certainly the first in Wales, to have electricity. The new incandescent bulbs, which Edison and Swan had introduced by the time Adelina Patti opened her private theatre on July 12th 1891, were much safer and convenient, but their light output was poor. It took 281 of these lamps to light the stage at Craig-y-Nos. In addition, Adelina Patti installed carbon-arc followspots. These used two rods of carbon with a voltage of around seventy volts DC applied across them. To "fire up" a carbon-arc lamp the ends of the rods were brought together, until an electric arc, or plasma, was "struck". They were then moved apart again slightly to make the arc stable. The carbon rods were slowly consumed (they became shorter) and had to be regularly moved together. Complicated mechanical mechanisms were developed to automatically maintain the gap between them and after a while both rods had to be replaced.